Who can say it better than Amitav Ghosh, the celebrated author of the Ibis trilogy, the master of evocative words and beguiling stories, when it comes to documenting the life of migrating Indians. Bihar, Uttar Pradesh and Bengal (including Bangladesh) continue to supply cheap labour to the rest of India today, just as they did in colonial times to British plantations in Guyana, Fiji and Mauritius. Does domestic migration serve public interest beyond the individual benefits it provides? Let’s consider what happens when stereotypes migrate and coverge physically. A single Tamil child of young, upwardly mobile, working parents in Chennai; reared by a Bengali nanny; driven around by a Bihari driver; taught by a Maharashtrian; living in a house built by masons and carpenters from UP who eats wheat grown in Punjab, cannot but be truly Indian. Into the consciousness of that child are woven, the stories and hopes of the rest of India. It is unlikely, therefore, that she would be content with just her Tamil identity. Of course the danger is that she could become the domestic equivalent of the ABCD (American Born Confused Desi). But any change has to start by perturbing the status quo. Strict “isolationists” would of course bemoan the demise of “pure” Tamil culture. They will quail at “bhel-puri” coupons being tacked onto tickets for a Bharatnatyam recital or retreat in horror from Bhangra rap at a jana vasam- south Indian baraat. But cultural cross-overs are the stuff that nations are built upon. The national identity project is not new. But in recent times it has been undermined by politicians who benefit from nurturing regional, cultural and religious silos rather than working actively to dilute them. This trend is now pretty much irreversible. But the hope is that with economic development, traditional identities-caste, religious or regional- will lose the urgency and prominence they have today. This happened before when the gains from more modern identities outweighed the limited and circumscribed benefits from traditional roles. Economic migration is a powerful lever for achieving this goal. Indian teachers, soldiers and merchants were willing to brave the “polluting” effect of crossing the seas even in the 19th century, so long as the professional prospects (think the legendary mathematician Ramanujam), the pay (Indian shippies), or the profit (Gujrati traders) provided sufficient incentive. The cost of “ritual purification” on their re-entry into India was trifling and the priests inventive and ever willing to oblige for a small fee. This practice of embracing multiple identities simultaneously, is the essence of any developed, open-access country. We need to go back to the future and against the stifling silos reinforced on us by colonialism. 30% of resident Indians do not live and work where they were born (2001 census). More Indians are born in the Northern and Eastern states than are the jobs available in such states. Given this asymmetry between population distribution and the availability of jobs, at least one half of the 10 million youngsters who come of age every year, will need to migrate for employment mostly to the western, southern, richer northern states and further abroad. Prime Minister Modi’s persistent wooing of the Indian diaspora can be seen from this perspective. Assuming responsibility for their woes (visas, quasi-citizenship rights, immigration hassles) is a master stroke to play to the sentiments of their families and friends in India. Why not extend the same strategy to the labour surplus states? There are no facilities today to socialize domestic migrants into the environment where they go. The assumption is that they would be socialized by friends or their employers. A more blithe assumption is that being Indians they don’t need socialization. Nothing could be further than the truth. Ghettos-ethnic, religious or regional are a fact of urban life. These are insulated and largely self-regulated. They perpetuate traditional identities rather than facilitate the development of new ones. If domestic migration has positive externalities- like helping develop a national identity or making labour markets more liquid- it is time we financed this public good. In a poorly targeted way we do so already by keeping railway fares much below the cost. Why not target support better to these brave hearts? The time is right to launch this public program aimed at documenting, understanding and alleviating the challenges of domestic migrations. Marketed correctly, this could be of huge interest in Bihar and Uttar Pradesh- two large states which go to the polls within the next two years. First, provide a digital friend (e-saathi) to the migrant. Migratory workers should be able to access a National Travel Support Service (NTS). This could be a toll-free number they can call nationally and seek advice from a digital friend on travel, accommodation, labour markets, wage rates and emergency response. The NTA could be administered by the Ministry of Labour and Employment since a large part of its work, albeit not exclusively, would be across state government borders. Ideally, management would be outsourced to a non-state or private agent. Over time it would become networked with local NGOs who work with migrant labour and provide a basic social safety net. The political attractiveness is obvious, not least because it is a pro-labour step. It would be most helpful for migrants in the informal sector, like in construction. It could extend a welcome helping hand, directly to one fourth of Indians who migrate, including for work. Second, a safe, transit home for poor migrants. Domestic migration is often also a consequence of social persecution of marginal communities at home. Trail blazers, who marry inter-religion or inter-caste are forced to leave. For the poorest migrants, the biggest problem is finding a safe shelter till they can get a job and move on. For NGOs who want to help this segment, the problem is finding the land to provide a shelter at a location where work can be found nearby. In the past, the Rail Yatri Niwas was a boon to the travelling middle class. These provided reasonably priced accommodation close to the railway station. Since then private hospitality facilities have exploded for this segment of travelers. 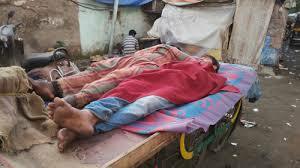 It is time now to shift to serve the poor by leasing small land segments out to NGOs who wish to manage the socialization of poor, urban migrants. This intervention in the “real sector” will give a face and teeth to the virtual friend. Cynics will dismiss this proposal as yet another mirage created by the smoke and mirrors of digital India. Other critics will rile that it is just another election gimmick. But pause and consider that the most practical public interventions are those which align with political economy and use the available entry points to enhance the public interest. This is one such win-win example. The families of poor migrants are unlikely to forget who helped to keep their migratory kith and kin safe, whilst simultaneously serving the public interest of social protection for the poorest.